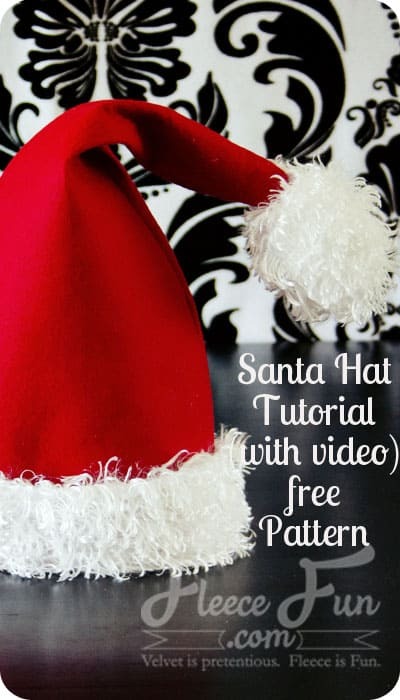 This Santa Hat how to is a snap to make! You can make a cute Santa Hat to bring holiday cheer to all who wear it… or at least a cute picture! There are multiple are multiple sizes to this pattern. 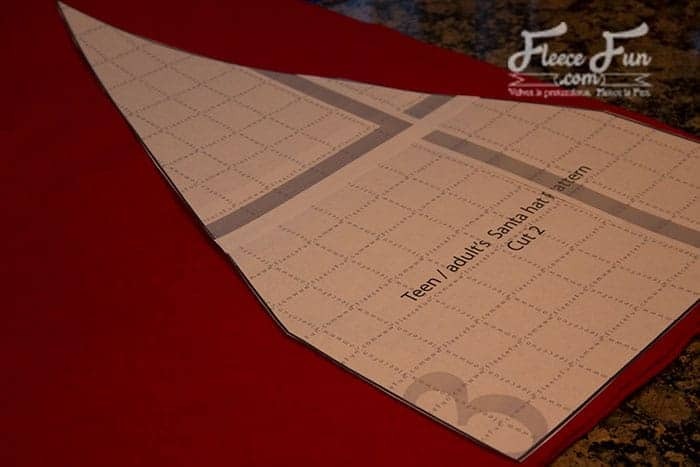 Please note if using felt – the fabric has no give so consider making a larger size if using felt. Fleece there is a little give to the fabric. Print up the pattern (you can get assembly instructions here . Cut out 2 of the main hat (large triangle). 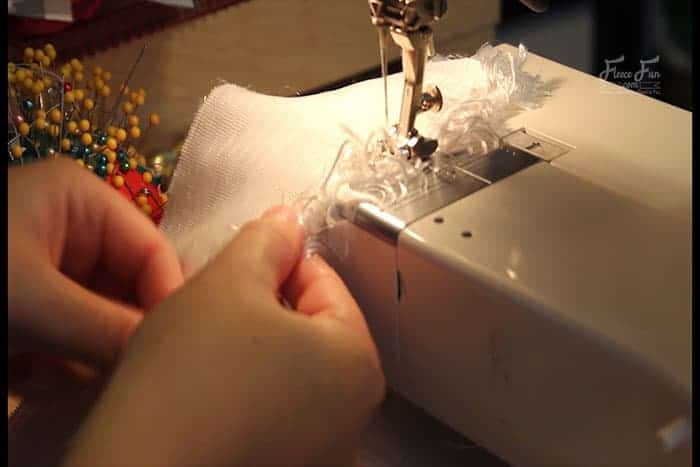 For the brim place on end on fold and cut to proper length – you should have one long strip. Cut two of the topper out of the same material as the brim. 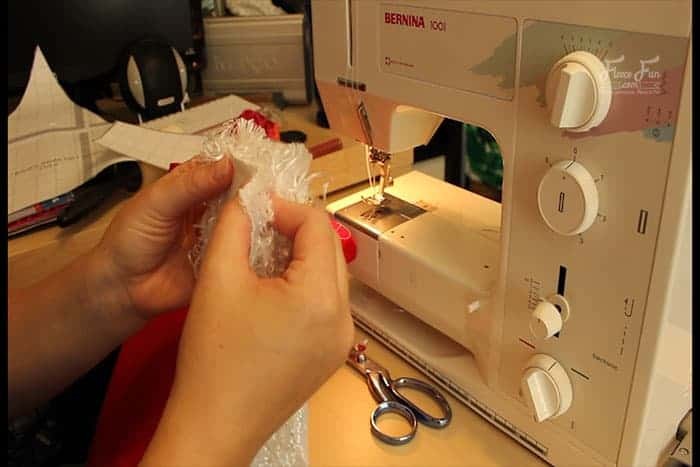 Taking the two topper pieces, place them right sides together and sew all the way around the ball with a .5 seam allowance. Leave a gap of about an inch at at the bottom where the tab is for turning. Turn ball right side out. 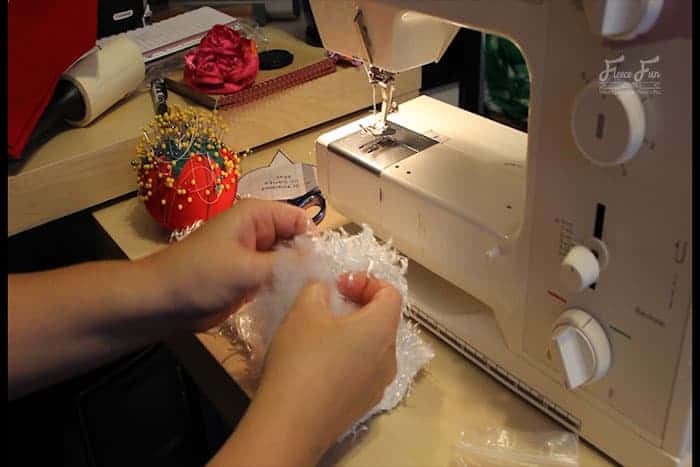 Put a little stuffing or fabric scraps in the ball to give it some fluff. Also for some extra Christmas cheer place a jingle bell inside the ball (optional). Sandwich the topper between the two hat triangle (right side should be facing in). The triangle end of the tipper should line up with the tip of the hat. 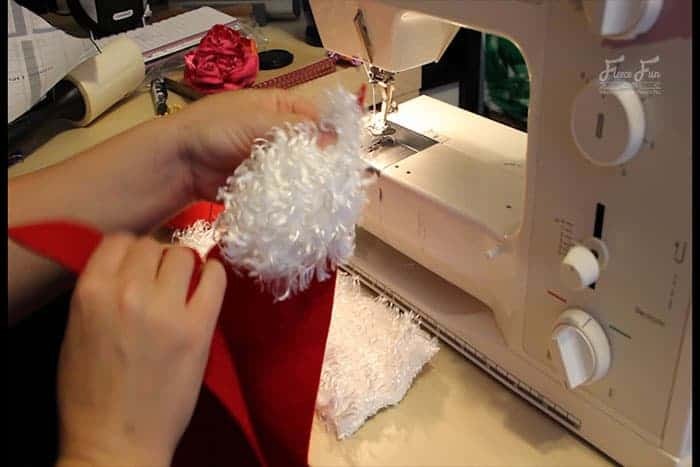 Pin the long side of the hat, and pin the topper at the top – pushing the main part of the topper out of the way. 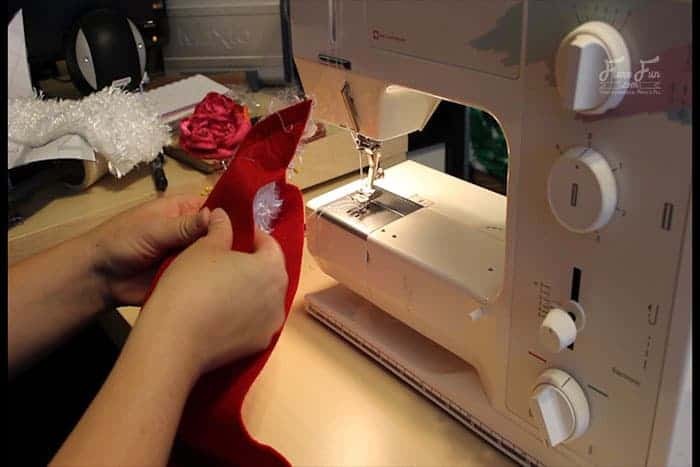 You just want to sew the triangle tab into the hat – the part you used to turn the topper right side out. 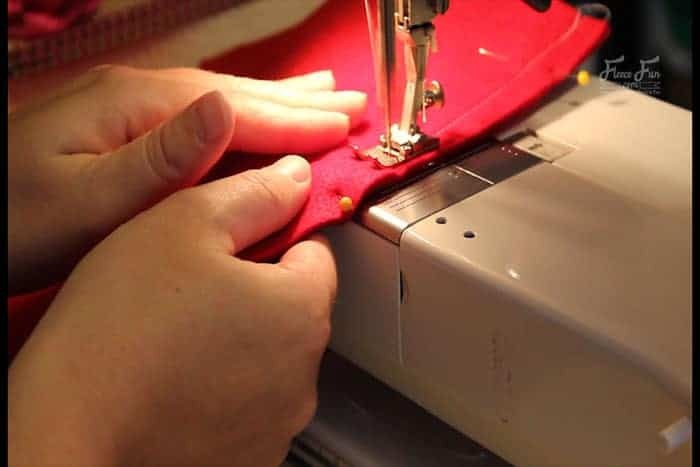 Sew with a .5 seam allowance along the side of the hat from the bottom to the top. 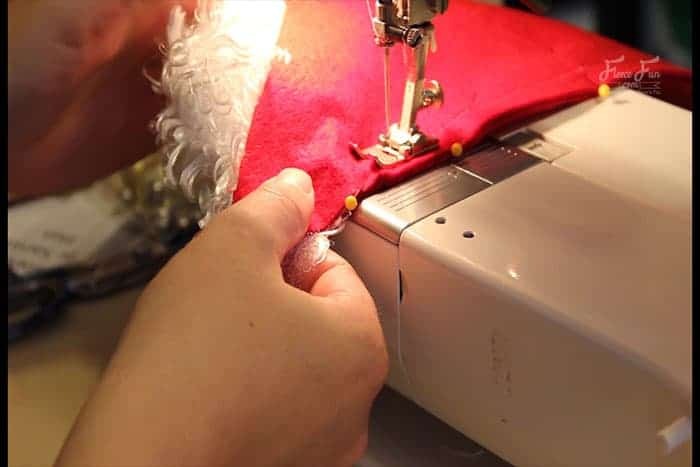 Stuff the topper into the hat – taking care that it won’t catch into the side seam you are about to sew. Pin the other long side of the triangle. 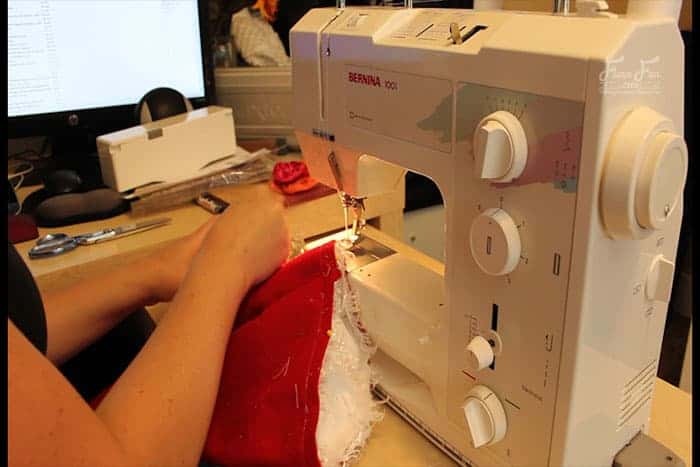 Sew the long side of the triangle from top (being sure only the sew the “tab” part of the topper) to bottom using a .5 seam allowance. Turn hat right side out and admire your work thus far. Turn under one side (the long side) of the brim and sew – a .25 seam allowance to make a nice finished edge. Now take your loop and pin it to the inside of your hat, right side of the brim facing wrong side of the hat – line up the seams to make it look nice. Sew on the brim using a .5 seam allowance. Trim threads, flip up brim and admire your new hat! 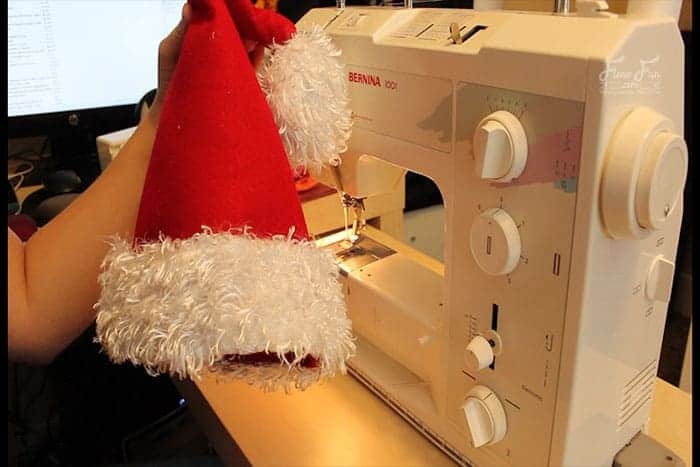 You just completed the Santa Hat How To. 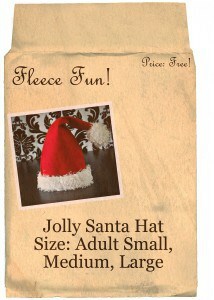 Just wanted to thank you for publishing this pattern… my 3 year old has been begging me for a santa hat. We were both excited to see this. 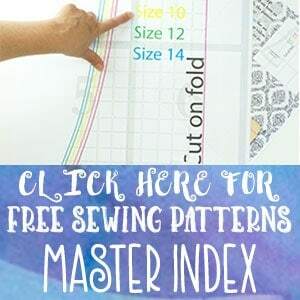 I’ve made several patterns from your site and every one has been so easy to print off, assemble and sew. Love it! Keep up the good work. I’m def a big fan…and a fan of fleece now too! Thanks for this pattern and tutorial from Spain. I needed it for a costume for my son. It’s great. 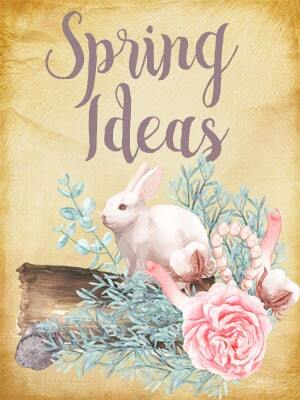 I just wanted to drop in and say THANK YOU for all your lovely patterns and tutorials. 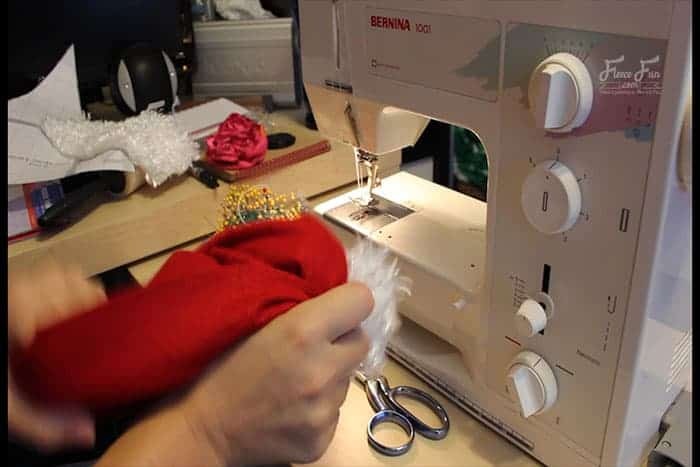 This isn’t the first time I’ll be using this santa hat patter (I’m leaving out the pom and the band and making an elf hat for a Link costume I’m making my daughter!) and it’s so simple and easy to follow, yet results are high quality! I’m excited to use the long cape pattern also, we’re going to be one organised family come halloween! 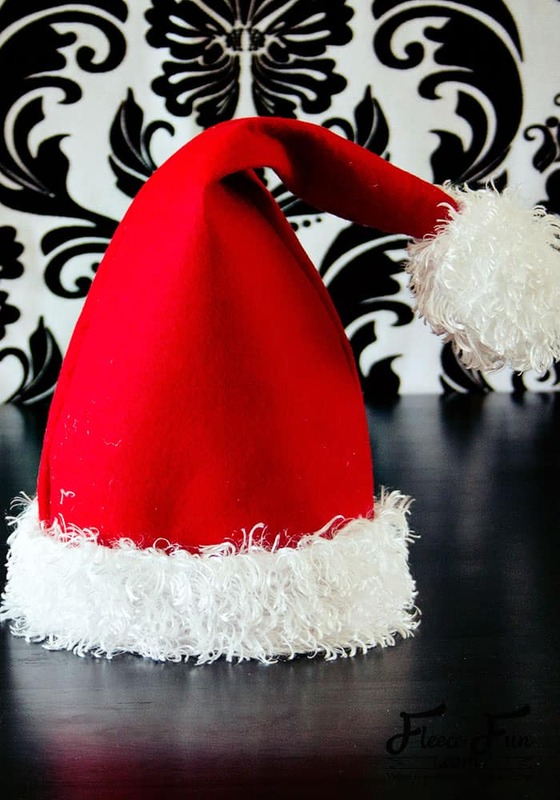 I’m using your newborn template as a guide for making Santa hats for my pets! It will make a cute Christmas card! Thank you so much!